In a recent research conducted by bio engineers at Queen Mary University of London have found a protein which might help in bone regeneration. 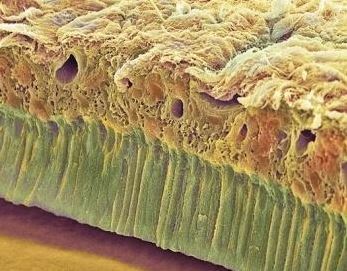 According to them it is a protein which can help or benefit patients who are suffering from Osteoporosis or Fractures. This part of protein or molecule is normally found in Enamel, this is a part of the protein “Statherin” which can be used in triggering growth of a particular portion of bone by using this in the region. Co-author Dr Alvaro Mata from QMUL’s School of Engineering and Materials Science and the Institute of Bioengineering says “What is surprising and encouraging about this research is that we can now use this particular molecule to signal cells and enhance bone growth within the body” . The molecule which was extracted from enamel was tried on Rats to stimulate bone regeneration which resulted in formation of newly calcified tissue, this was identified after the team used different proteins to create bioactive membranes which in turn showed the importance of this particular molecule in inducing Bone Growth. The molecule in turn is said to be handled easily and also can be applied over injured areas in the bone directly to induce bone regeneration where ever it is needed. Apart from inducing bone growth on the patient we can even create synthetic bone grafts clinically which can in turn be used to stimulate the natural regenerative process in the patient’s body once introduced which could not be done till now with any Synthetic Bone Graft material. This material can help in dental regeneration of bone in cases of any cysts or tumours which might lead to loss of bone or in case of Resection surgeries in Carcinoma cases of Mandible which require removal of part or whole of mandible. Apart from the oral cavity this can be used all over the body in many bone related ailments like Osteopetrosis etc where bone regenration is a very important part of the treatment. References: This Article was funded by European Research Council and the Spanish Government and taken from the Queen Mary, University of London.